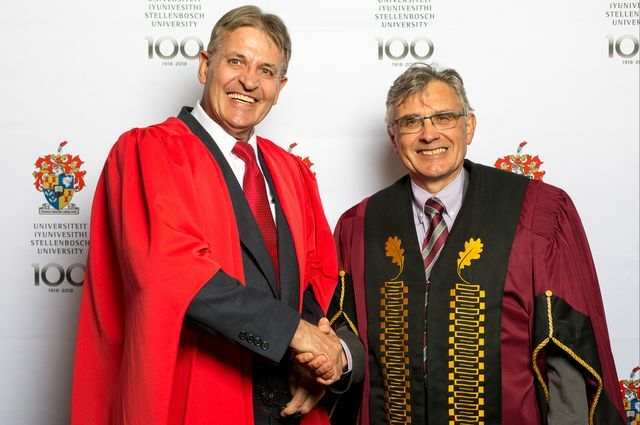 UCLA professor Andre Nel, left, and professor Wim de Villiers, rector and vice-chancellor of Stellenbosch University. 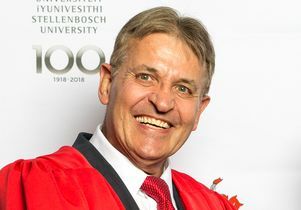 André Nel, associate director of the California NanoSystems Institute and distinguished professor of medicine in the David Geffen School of Medicine at UCLA, was recently bestowed an honorary doctorate by Stellenbosch University in South Africa, his alma mater. Nel was honored for his multiple high-level and consistently excellent contributions to the science of nanomedicine, allergy and immunology, which have not only advanced medical science and technology globally, but continue to have a tangible impact in ensuring a safe, healthy and environmentally friendly world. UCLA professor Andre Nel and professor Wim de Villiers, rector and vice-chancellor of Stellenbosch University.